Algiers (VNA) – Vietnamese Ambassador to Algeria Pham Quoc Tru recently visited Tlemcen province from August 22-24 to promote economic and trade cooperation between Vietnam and the province. During a working session with Benyaiche Ali, Governor of Tlemcen, the Vietnamese diplomat highlighted the relations between Vietnam and other nations, particularly Algeria, and expressed his hope to bolster the multilateral cooperation between the two sides, including at local level. Tru pointed to the good potential for partnership between Tlemcen, which is a leading cultural, tourism hub of Algeria, and Vietnamese localities. He asked the province to coordinate with him to promote links with Vietnam’s localities. Benyaiche Ali valued the traditional friendship between the two nations, and expressed his hope to develop the relationship between the locality with Vietnam, particularly the possibility to develop twinning relations with a province or city of Vietnam. During the stay, Tru also had a working session with the provincial Chamber of Commerce and Industry and local firms. 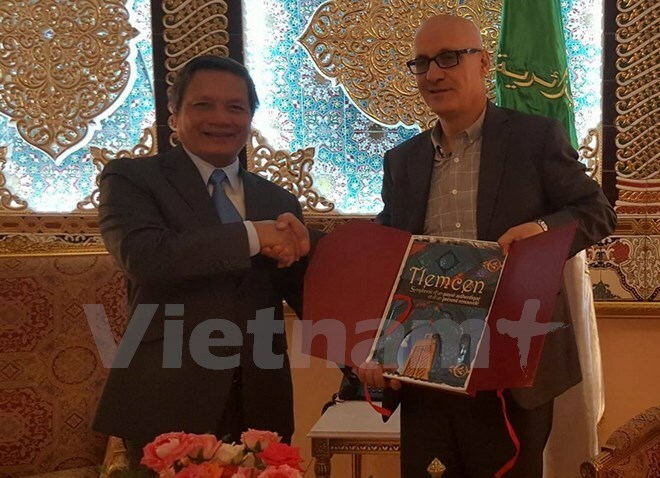 The two sides briefed each other their own potential and market, and exchanged measures to promote cooperation and connection between businesses of Tlemcen and Vietnam. The Chamber called on Vietnamese firms to invest in producing consumer goods, textiles, footwear, mechanical manufacturing, electronics, agriculture and construction in Tlemcen.